Back in my teens, I went through a bit of a badass phase. I didn't get any tattoos and I didn't pierce my nose or tongue, but I did pierce multiple holes in my ears. And, while I've forgone putting earrings in them for the past few years, now I'm back to dressing them up ... thanks to Giles & Brother Tiny Safety Pin Earrings, that is. These little studs make me feel like a total rockstar. And, even though they're pretty tiny, they get noticed more than my big chandelier earrings! I've actually had people stop me on the street and tell me how cool they think my earrings are. I purchased my pair on Shopbop -- and while they've sold out there, you can purchase them for $85 here. Those are cute! 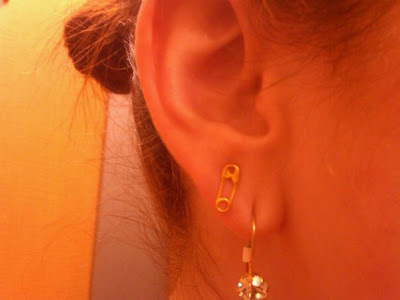 I remember seeing people with safety pins actually through their ears in the 80s - this is much less scary!